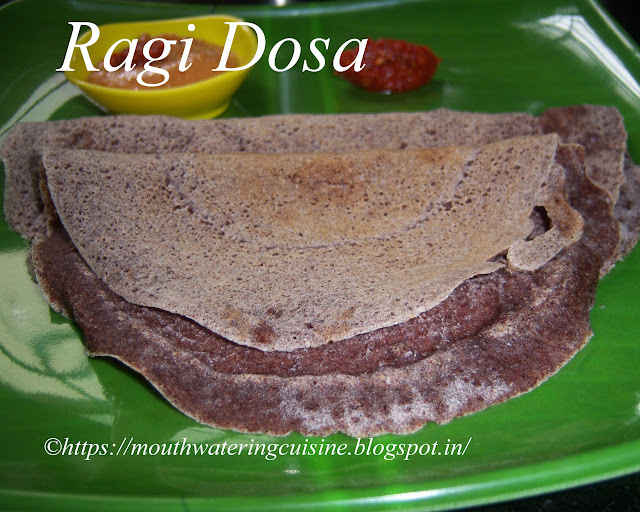 Today I will post how to make ragi dosa. A very simple, easy and healthy breakfast recipe. It can be prepared instantly without any prior preparation. Ragi or finger millets are really a good for health, they help in weight loss and also improves immunity.They are the good source of vitamins and minerals. They also very helpful in maintaining blood pressure. Nowadays I am making ragi dosa almost regularly for me and my hubby. Making ragi dosa is as easy as, rather more easy than, making plain dosa. We can prepare it instantly. We can prepare the batter in two ways one is, just mix the flour and salt and add water, the other one is soaking ragulu in water for about 30 minutes and grind it to make a fine batter and add salt. I normally folllow the first one as long as I have flour available with me. To give more spices and flavour to it we can add chopped onions and green chilli paste also to it. Dosa made with finger millets. In a mixing bowl take ragi flour and add salt to it. Add water to the flour and make a batter. It should be like that of plain dosa batter, neither too thin nor too thick. Mix well so that there won't be any lumps in the batter, if adding onions and green chillies combine them also in the batter. Heat dosa pan. I use iron skillet for making dosa, but we can use non stick dosa pan also. Sprinkle little water to check the heat of the pan. If the water evaporates immediatley the pan hot enough to spread dosa. Reduce the flame and take ladle full of batter and spread it in circular motion outwardly on the hot dosa pan. Cook dosa on medium high flame, it automatically leaves the pan once it is done. Flip it with a spatula and cook for two minutes. Serve hot ragi dosa with peanut chutney and erragadda karam.